This sounds like a very fun event and thought it would be of interest to some families who like to dance. There’s one tomorrow at reDiscover in Mar Vista. Proceeds go towards charity. Here are the details for tomorrow’s event. There’s another one in Hollywood and Glendale. · Sunday, April 3 – Dim Mak Studios, (formerly Cinespace) Hollywood, 12-3 pm. Tickets: $20 / $60 family 4-pack. The Baby Loves Disco Superhero Tour celebrates everybody’s inner superhero,and prove that moms, dads and kids of all sizes all have special powers worthy of superhero status. Families are invited to come in costume or just as they are, joining the Baby Loves Disco dancing nation. The tour will feature special guest superhero DJs and MCs in addition to new big video screens, dance instruction, super contests and surprises at every turn. At its core, each event retains the patented mix of Baby Loves Disco magic that has helped connect a worldwide community of moms, dads and kids of all nations, of all colors and all walks of life all in the name of dance (and fun!). Baby Loves Disco is an internationally acclaimed family dance party, founded six years ago by two parents in Philadelphia. Since then, Baby Loves Disco has gotten parents and kids grooving at all kinds of venues, including those in the 45-city Baby Loves Disco Lemonade Tour in 2010. In recognition of the global reach of Baby Loves Disco, Babble.com chose co-founder Heather Murphy Monteith as one of the top 50 “Mompreneurs” in the country. Co-founder Hurwitz was also recently featured as a notable dad in Parents’ magazine. Wrestle Mania Has Come To Our Living Room! We now have a queen sized mattress sitting on our living room floor. It takes up a lot of space and my daughter can no longer ride her new tricycle around our place with ease. It was our former mattress until my husband’s side grew too lumpy. It then sat beside our bed for over a year. My husband was hoping it would become a place for where my daughter would sleep. No. Now it sits on our living room floor because we’ve had a flow of house guests. We might just kept it there because when it doesn’t serve as a bed, it’s an amazing trampoline and most recently, a wrestling mat. Wrestle Mania has come to our living room! Every morning and most nights, if anyone comes calling, they will find the whole family – even our cat accidentally sometimes – wrestling on our extra mattress and it isn’t tame. My daughter is pinning us down, using the force of her legs to push us off and throw us onto the floor. My husband is using his full force to get me down while I play dirty and use my nails. He has an almost fifty pound weight advantage. I guess excuses are never a real reason to fight dirty… what if I say I use my nails with his permission and don’t scratch too deeply? Sometimes, I bite too… so does my daughter though her bites tend to be wet and leave absolutely no marks. My bites don’t break any skin, just a slight imprint for a few minutes. Those are my techniques to gain the upper hand from my husband in play. Fred O. Davidson has an amazing theory of play called Original Play. He also holds workshops around the world. His theory is based on getting back to our animal ways of playing and connecting – to be wolves with each other, and play together which involves our physical nature. When Mishy was younger, we would head near Ocean Park Blvd where the beach meets near our home in Santa Monica. There is a large flat grassy area. Mishy and I would lie there together, then both get on all fours and be wolves together. She would climb on top of me, we would gently wrestle and sway together. She would lead me in how she wanted to play. We would play as animals together. I feel this newfound love of wrestling is a continuation of our physical play – one that invokes a lot of laughter, play, delight, and even tears – tears in line with Hand In Hand’s Playlistening – where through play, children are able to release and work on their fears, feel powerful and test themselves. I received Hand In Hand’s DVD of Playlistening a few months back after participating in a focus group for them and recently asked my husband to view it. I am so thankful I have a husband who is willing to view these progressive parenting DVDs. 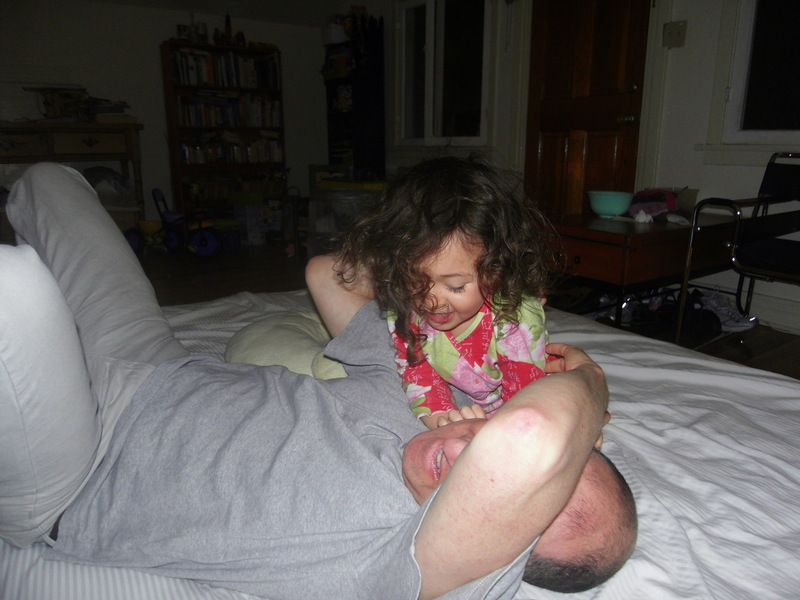 The next day of wrestling increased in joy and my husband was giving me pointers on how to play with my daughter – which I found incredibly refreshing. 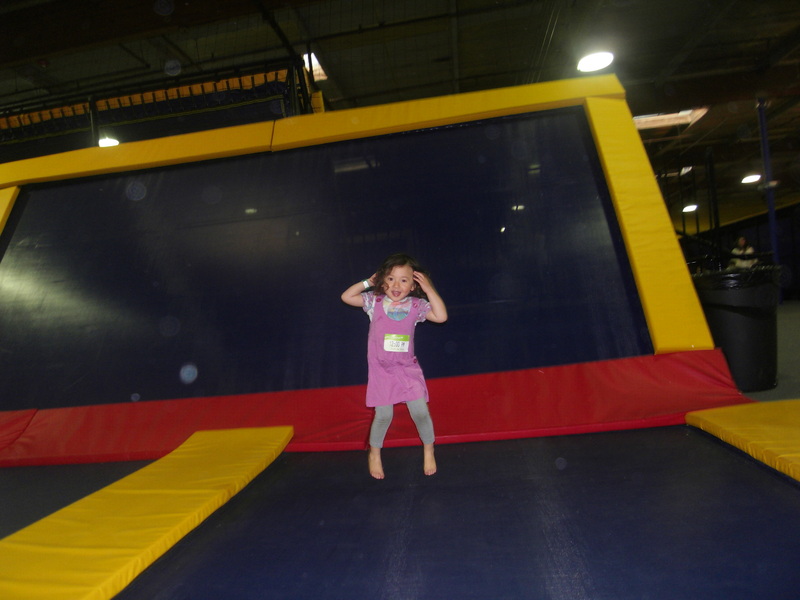 Sky High Sports has five rooms of various sizes where you can jump to your heart’s content. There’s a room devoted to dodge ball, one for children 8 years and under and one you may rent for your private functions. A mother I met at Sky High Sports told me she first heard about Sky High Sports when she came for a friend’s birthday party and now visits once a week because she loves it there. Her kids do too. She also said the birthday party was fabulous. There is a lot to love at Sky High Sports. It’s a place for the whole family of all ages. It has video games off to the side, an air hockey table and did I mention the five rooms for jumping? One where you can book for your own private party? There are also two rooms upstairs if you want to your function to be at a lower volume – away from the music. The music isn’t too loud once you start jumping. When we were there, Jump by Eddie Van Halen was playing. Mishy and I jumped for one hour. She was smiling the whole time. She loved that she could jump with her bare feet. (Gyms shoes are allowed during jumping.) If there was a location closer to home, we would be at Sky High Sports everyday because I like to exercise and be with my daughter at the same time. Plus, it was wonderful to see her laughing the whole time we were there. I am so thankful that Sky High Sports has agreed to giveaway four one hour free jumping tickets to one lucky winner. Please comment if you would like to win. If you visit there website: www.jumpskyhigh.com – and comment once again, you will have an additional entry. Sky High Sports has several locations throughout Southern California as well as several in the state of Washington and one in Portland, Oregon. If anyone is interested in starting a franchise in westside of Los Angeles – please do and you can count on us as regular customers! The reason why I like this place so much is because it’s free open play time of jumping – you can do flips, jump across the room, jump from trampoline to trampoline, jump on to the walls, the possibilities of jumping are endless. *The giveaway ends midnight, February 28th, 2011. The passes do not have an expiration date and are valid at all locations. Want to enter to win more giveaways? Click on the Giveaway tab on the right side! Sesame Street Presents: The Body offers an engaging, free-flowing learning experience set in the fun, familiar and reassuring world of Sesame Street. The loveable Sesame Street Muppets anchor an exciting collection of hands-on, interactive and multimedia experiences that allow children to explore the human body and how to keep it healthy. Each exhibit area has multiple activities to provide age appropriate and exciting learning opportunities for children at a variety of developmental levels. The exhibition emphasizes scientific investigation and developmental and curriculum-based learning goals for children ranging from two to eight years old. These learning goals tie into the National Science Education Standards, the Benchmarks for Science Literacy and the Sesame Street Healthy Habits for Life Curriculum. Each component of The Body exhibit is geared toward children’s natural excitement about learning,” added Anna Housley Juster, Director of Content, Sesame Workshop. The Body will be exhibited at the Discovery Science Center January 29, through May 1, 2011. In addition, children and adult caregivers can explore the exhibit prior to their visit online at: http://www.sesamestreetpresents.org. Sesame Street Presents: The Body is at Discovery Science Center January 29, 2011 through May 1, and to celebrate this new exhibit we’re celebrating the beloved Muppet, Elmo on his birthday, February 3 from 6PM-8PM! Join us for birthday cake, VIP access to the Sesame Street Presents: The Body exhibit and a special visit with Elmo. This is a private event, after-hours. Our friends at Sensitive Sweets are making Elmo’s birthday cake gluten-free, soy-free and allergy-free so all kids (and adults) can enjoy! If you would like to be entered, please email me by midnight, January 12th at: naturaltravelingmomma@gmail.com – include your name and number of people in your party – maximum number is 4. Mishy will draw the two names on Saturday morning. To follow Discovery Science Center on Facebook and Twitter, here are the links. Mishy looking at Silver, the director of Silver Horse Healing Ranch. Yes, the ranch is named after Silver. 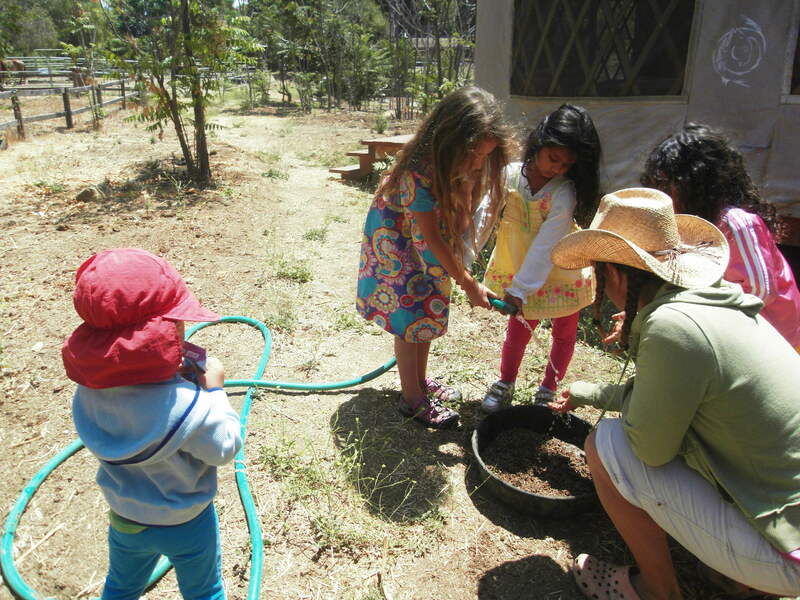 We’ve been going to the Silver Horse Healing Ranch in Topanga for 6 months. Mishy loves it there. 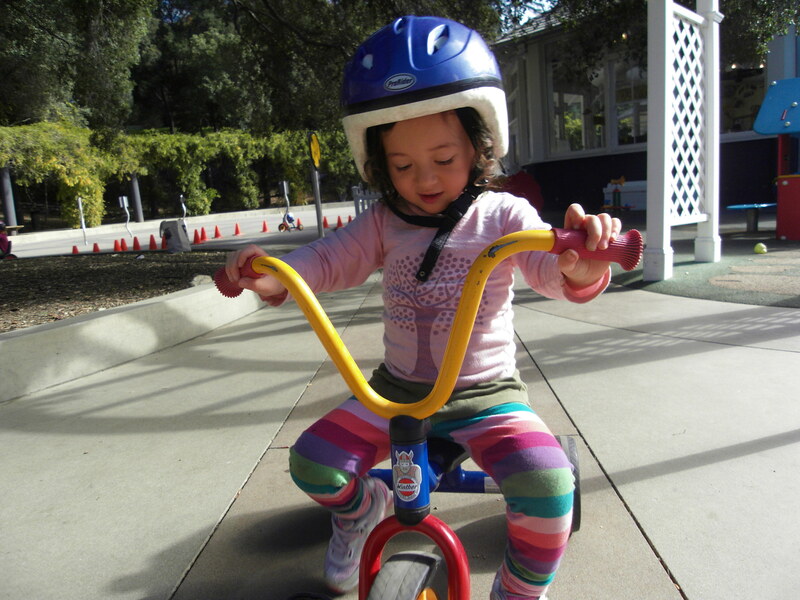 She takes part in two group lessons twice a month with other children, which I’ve organized. The lessons are for children starting at age 2.5 years old. 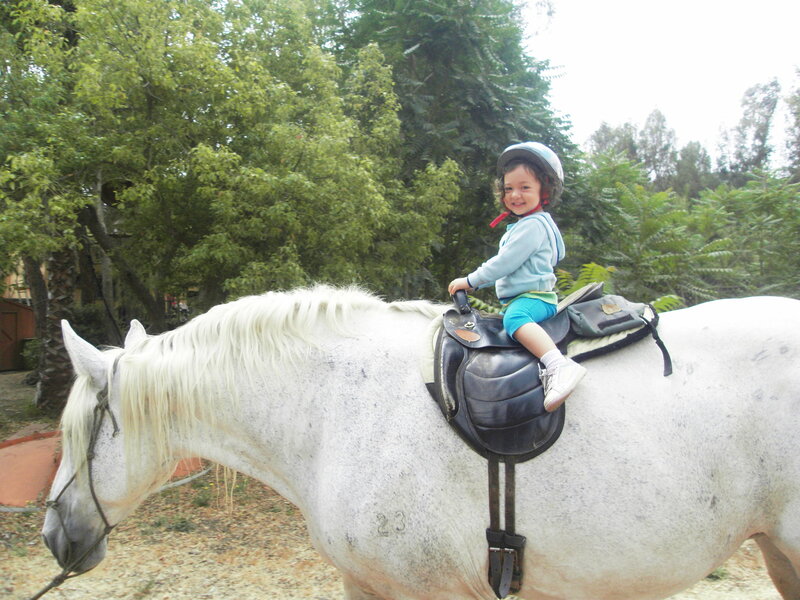 The children have a gentle ride – either around the stable or on a trail – depending on the child’s age and ability. The parents are able to walk alongside the horse or stay by the stables and talk to the other parents, or take pictures. 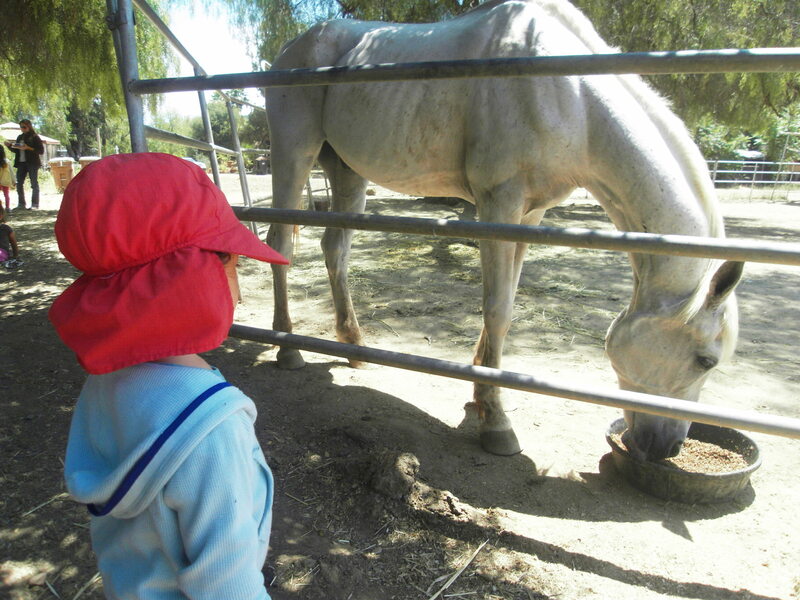 After the horseback ride, the children may brush, massage, and groom the horses. Once that is completed, the children lead a horse with a rope, usually Silver – and learn other natural horsemanship skills such as how to tie a horse to a fence or tree or feed Silver her food of beet leaves. Finally, the horses are given snacks of carrots and apples. We have learned it’s important to be aware of the hierarchy of the horses at the ranch. Each herd has a social order and the horses higher up on the hierarchy must be given carrots first – Sara explains this prior to the children feeding the horses. She also shows us how safely to feed them. Riding Laydee - her first time on a draft horse. I found out about her via Family Finds – this is a great online website which feature special deals that are family oriented in the Los Angeles Area. It also features recommendations for families to go out and do things together. Here is my referral link if you would like to sign up to family finds. I love this site. I have bought several deals on this site and have not been disappointed. Another great thing about this site – if you purchased a deal, have not used it, and would like a refund on the deal, you have 30 days to ask for one. 30 days! So, you’ll never get buyer’s regret.